It doesn’t take a master translator of Fed speak to figure out that this means the easy money spigot will remain open for as long as it takes for employment — and by extension, the economy — to recover. Now, you might think that the recent data that has come in lately on retail sales, consumer confidence and, yes, even employment, suggests that the economy is improving. Yet if that is the case, then why did Bernanke offer up the not-so-subtle confirmation that he and his merry band of central bankers would keep juicing the economy with cheap dollars? Perhaps it’s because Bernanke knows that whatever nascent signs of a recovery do exist are fragile at best, likely unsustainable — and possibly evanescent. The reaction to Bernanke’s confirmation that the Fed would remain accommodative for some time was predictable, with stocks first knocking on the door of multi-year highs, and then smashing through that door with ease. The Dow surged 161 points on Monday, or 1.2%, while the S&P 500 added 19 points, or 1.4%. The chart above of the S&P 500 tells the story of a market riding the easy money wave higher. So, what should investors make of all this? 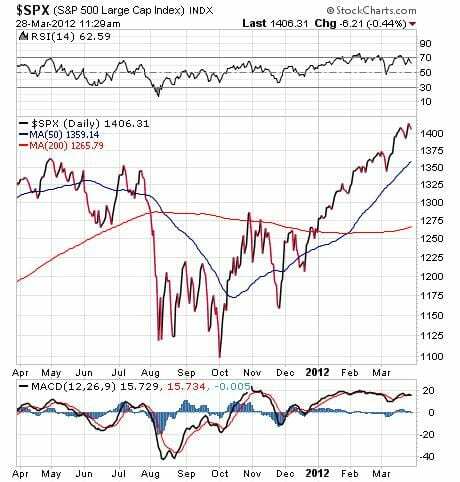 In my opinion, the latest move to new highs should be viewed as a red flag. I think this rally is likely to stall at virtually any moment, and any negative news on the economy, more pain at the gas pump, or a breakout of political unrest in the Middle East could cause recent buyers of this market to get caught in a classic bull trap. I am advising readers of my Successful Investing advisory service to approach this market with extreme caution, and to get caught in a bull trap. I’m also advising that there will be plenty of better opportunities to get into stocks once the froth of this Fed-fueled market settles. If you read the financial media as much as I do, you’ve likely read about how little fear there is in this market right now. One such measure of the lack of fear is the Chicago Board Options Exchange’s (CBOE) Volatility Index, more commonly known as the VIX. The VIX is quoted in percentage points, and translates roughly to the expected movement in the S&P 500 index over the next 30-day period. If the VIX is rising, it means there is strong anticipation that sellers are about to gain control, i.e., putting more fear in the market. Conversely, if the VIX is trending lower, it means bulls are firmly in charge of the ranch, and thus reducing fear. So far this year, the VIX has plunged more than 50%, indicating that fear has not been a factor on Wall Street in 2012. In fact, the VIX now is trading at its lowest point in nearly five years, and the fear gauge appears to be running on empty. 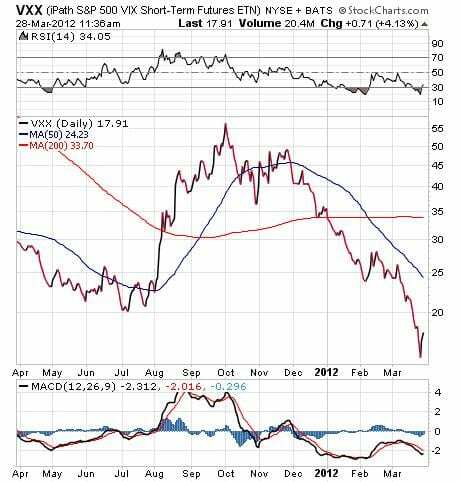 The chart below of the iPath S&P 500 VIX (VXX) shows just how little fear is present in this market right now. When I look at this chart, and the lack of fear it displays, my contrarian meter gets pegged to high. In fact, I think the lack of fear in the markets is exactly when you should really avoid going long in stocks. Remember that when everyone gets bullish, usually that’s the time when the smart money takes its profits and heads for the safety of cash. As you see fear get tossed aside in favor of intrepid buying by the herd, think of it as a sign that the end of this bull run is getting very, very close. In last week’s Alert, I pointed out how China’s economic slowdown is indeed real, and that one key measure of that country’s economic health was the deceleration in auto sales. Since then, there’s been another key measure of economic health that’s come in lower, and that is the poor manufacturing reading from HSBC. The result of these negative metrics was a sizeable decline of 4.7% last week in the iShares FTSE China 25 Index (FXI). As you can see here by the chart of FXI, large-cap Chinese stocks now are trading below both their short-term, 50-day moving average and their long-term, 200-day moving average. The drop in Chinese stocks could be a harbinger of things to come for global markets, and we’ll have to see if the selling in stocks pegged to the world’s second-largest economy begins putting pressure on other global markets. One thing for certain is that there are ways to take advantage of the decline inChinaby using exchange-traded funds (ETFs) that are designed to move higher when traders sour on the sector. We’re doing precisely that in my ETF Trader advisory service with one such ETF. This fund actually is gaining ground at twice the rate that FXI declines, so China’s pain gives us a double-dose of gain. If you’d like to find out how you place a winning bet on China’s woes, check out my ETF Trader advisory service right now. The man who has been called the father of modern management knew that in order to properly conduct your affairs, you have to be able to measure them. When it comes to your money, you have gains and losses to measure, but you also have costs of services, cost of lost opportunity, and a host of other things that can be measured. Knowing how to measure your progress is one key to monetary success, and helping you get a handle on these measurements is just what the Alert — and all of the Fabian services — are all about. Overall, U.S. stock markets were flat again this week, with the S&P 500 eking out a 0.50% gain. 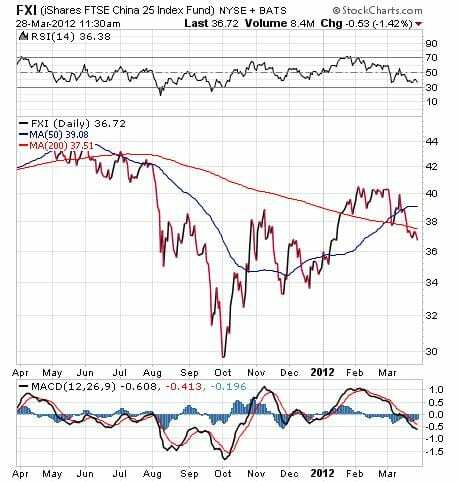 Global markets matched that performance with the MSCI Emerging Markets Index rising 0.60%.